Note: This is a downloadable product. It is also available in a CD format. 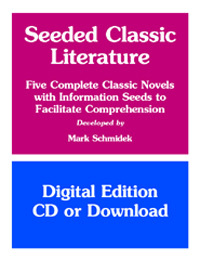 Help students read complete editions of classic novels that include "seeds" of information to facilitate vocabulary learning and reading comprehension. Students have difficulty understanding the vocabulary, phrasing, and factual references contained within classic novels that were published many years ago. By adding information seeds to the text, the students have a tool that they can use independently. Seeded literature is a differentiated approach that can be used within the general education curriculum or in special education programs. This product may also be ordered in a CD format (see options below).